Russia hit back just before the interval as Artem Dzyuba nervelessly converted a penalty awarded for a handball by Gerard Pique. “We are having a fantastic World Cup,” said Akinfeev. Russia will meet either Croatia or Denmark for a place in the semi-finals, as Spain’s rotten run against hosts nation at major tournaments continued. Fernando Hierro made the bold decision to drop Andres Iniesta for Koke in central midfield, with Marco Asensio handed his first start of the competition. Aleksandr Golovin carved out their first chance of note, starting a move with a jinking run before bending just wide of David de Gea’s left-hand post. Isco produced a series of regal touches with Spain’s King Felipe VI among those in the crowd at the Luzhniki Stadium, but Russia equalised shortly before half-time. Dzyuba calmly sent De Gea the wrong with his penalty to join Cheryshev on a team-leading three goals. Akinfeev snuffed out an opening for Diego Costa on the stroke of half-time as the Spain striker tried to latch onto a through ball. Cherchesov introduced Cheryshev for Alexander Samedov on the hour, a move greeted by a deafening roar from the home support. Aspas nearly picked out Carvajal with a cut-back seconds into the start of extra time, which saw Aleksandr Erokhin come on as Russia’s fourth sub — the first time the rule has been applied at the World Cup. 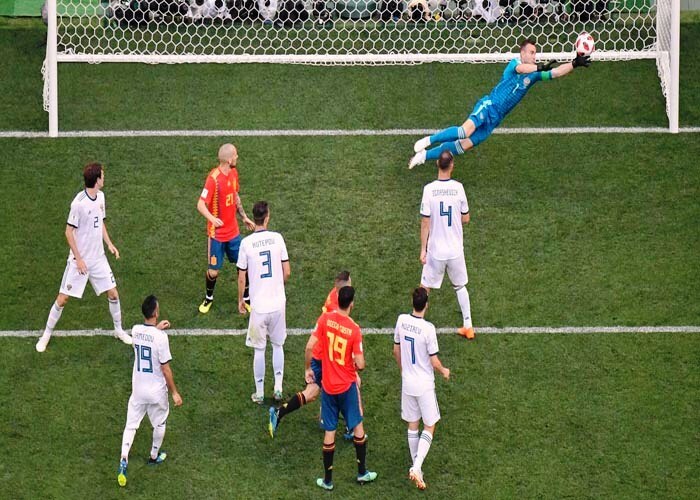 Russia endured a tense wait when Kuipers was in communication with the video assistant referee following a late tug on Pique in the box, before Akinfeev’s shootout heroics clinched an unforgettable triumph.